加藤孝太郎, 鈴木市郎, 豊田剛己, 田渕浩康. (2014). 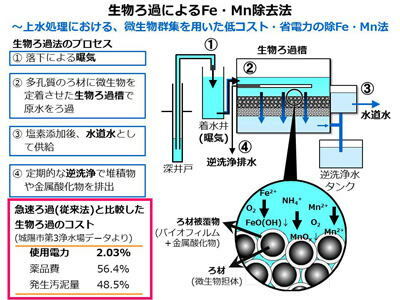 "汎用型ミニスラブゲル電気泳動装置による土壌微生物群集の変性剤密度勾配ゲル電気泳動(DGGE)解析." 農業・環境・健康研究所報告, Vol.2, 37-43. 鈴木市郎. (2012). "生物ろ過がつくるおいしい水: 微生物複合系による地下水からの重金属除去." 生物工学会誌, 90(4), 170-173. 鈴木市郎, 山本直哉, 川辺允志. (2012). "銅合金熱交換器管異常潰食の解明(2) マンガンイオンの生物的酸化." 検査技術, 17(3), 23-28. Kawabe, A., Suzuki, I., Yamamoto, N., Hamada, M. (2010). "Formation mechanism of manganese-rich deposit." Corrosion Engineering (English translation of Zairyo-to-Kankyo), 59(2), 30-36. 川辺允志, 鈴木市郎, 山本直哉, 濱田稔. (2010). "マンガンに富む付着物の生成メカニズム." 材料と環境, 59(2), 50-55. 鈴木市郎, 武田穣, 小泉淳一. (2009). "微生物群集を用いたバイオフィルトレーションによる地下水からの除鉄・除マンガン." 日本醸造協会誌, 104(6), 405-411. 川辺允志, 鈴木市郎, 山本直哉, 濱田稔. (2009). "銅合金復水器管「異常潰食」発生メカニズムの解明: その1　経緯ならびに富マンガンスケールの解明." 火力原子力発電, 60(1), 59-66. 川辺允志, 鈴木市郎, 山本直哉, 濱田稔. (2009). "銅合金復水器管「異常潰食」発生メカニズムの解明: その2　マンガン酸化細菌の同定と酸化能." 火力原子力発電, 60(2), 160-168. 川辺允志, 鈴木市郎, 山本直哉, 濱田稔. (2009). "銅合金復水器管「異常潰食」発生メカニズムの解明: その3　マンガンに富む付着物の人工再現並びに総合考察." 火力原子力発電, 60(3), 263-267. 鈴木市郎, 武田穣, 小泉淳一. (2008). "微生物群集による地下水からの除鉄・除マンガンのメカニズムとヒ素吸着除去への応用." 生物工学会誌, 86(12), 605-607. 藤川陽子, 濱崎竜英, 菅原正孝, 南淳志, 殿界和夫, 鈴木市郎. (2008). "鉄バクテリア活用の水処理技術　−1. 鉄バクテリア法の原理−." 用水と廃水, 50(1), 18-25. 鈴木市郎. (2002). "死菌細胞内におけるRNAの寿命の解析." 三島海雲記念財団平成13年度研究報告書, 39, 49-53. 鈴木市郎, 小泉淳一. (2002). "核酸診断法による食品中の微生物動態のモニタリング." 食品と技術, 345, 1‐9. 鈴木市郎. (2001). "環境中の微生物の多様性を数値化する." 生物工学会誌, 79(2), 44. 鈴木市郎, 上神久典, 小泉淳一. (1999). "食品中の迷入微生物の核酸診断法による検出." 食品工業, 42(16), 37-44. 鈴木市郎. (2014). "第3章 メタルバイオテクノロジーの応用 3.2.2. 水からの金属除去〜上水と廃水〜." 山下光雄, 清和成（編著）「地球を救うメタルバイオテクノロジー」, 成山堂書店, p.78-87. ISBN978-4-425-80001-8. Suzuki, I., Sahabi, D. M. (2012). "Chapter 2. Biological treatment for removal of iron, manganese, and arsenic from groundwater." In Ike, M., Yamashita, M., Soda, S. (Ed.) "Handbook of metal biotechnology. ", Pan Stanford Publishing, p.11-25. ISBN978-981-4267-98-4. 鈴木市郎, 小泉淳一. (2009). "微生物群集による鉄・マンガン含有地下水の上水処理とヒ素除去." 吉田和哉, 植田充美, 池道彦（監修）「メタルバイオテクノロジーによる環境保全と資源回収−新元素戦略の新しいキーテクノロジー−」, シーエムシー出版, p.21-26. ISBN978-4-7813-0117-4. Suzuki, I., Back, J., Nakamura Gouvea, N., Takeda, M., Koizumi, J. (Oct. 2016). "Analysis of bacterial contamination routes in the production process of traditional fermented food using next generation sequencing." 17th International Biotechnology Symposium and Exhibition (IBS2016). 92. (Melbourne, Australia). Tian, X., Takahashi, N., Suzuki, I., Yamazaki, Y., Hasegawa, A., Kobayashi, T. (Sep. 2016). "Comparison of effect of temperature on cis-DCE dechlorination amended with multi-electron donor compound." 6 th Joint Nordic Meeting on Remediation of Contaminated Sites (NORDROCS 2016). (Espoo, Finland). Tian, X., Takahashi, N., Suzuki, I., Yamazaki, Y., Hasegawa, A., Kobayashi, T. (Aug. 2016). "Effect of temperature on Dehalococcoides dechlorination performance and gene abundances." Water and Environment Technology Conference 2016 (WET2016), 3A-03 (Tokyo). Yamazaki, Y., Hasegawa, A., Tian, X., Suzuki, I., Kobayashi, T., Furukawa, Y., Shimizu, T. (Aug. 2016). "Effect of thermal-enhanced anaerobic bioremediation on dechlorination performance and microbial community structure." 16th Internatiponal Symposium on Microbial Ecology (ISME-16). (Montreal, Canada). Suzuki, I., Sakaue, S., Sakoda, S., Koizumi, J. (Aug. 2015). "Next generation sequencing of bacterial communities involved in biological filtration system for the removal of iron and manganese from groundwater." Water and Environment Technology Conference 2015 (WET2015), 2B-12 (Tokyo). Kanai, R., Nittami, T., Yamada, T., Suzuki, I., Fukuda, J., Watanabe, M. (Aug. 2014). "Identifying the bacteria causing bulking with fluorescence in situ hybridization (FISH) and realtime PCR. "Water and Environment Technology Conference 2014 (WET2014), 28-1B-13 (Tokyo). Suzuki, I., Fujita, T., Tabusa, H., Koizumi, J. (2012). "Bacterial compositions of biological filtration plants for removal of iron and manganese from groundwater." 15th International Biotechnology Symposium and Exhibition (IBS2012). P-S5-0069. (Daegu, Korea). Thapa Chhetri, R., Sahabi, D. M., Oda, T., Suzuki, I., Takeda, M., Koizumi, J. (2010). "Biological removal of Mn2+ from water by mature biofilters." Water and Environment Technology Conference 2010 (WET2010), 25-2A-09 (Yokohama). 飯田早紀, 鈴木市郎, 三好萌栄子, 杉田龍兵, 武田穣, 小泉淳一. (2016). "生物ろ過槽由来Mn酸化細菌群集の培養と硝酸濃度の影響." 第68回日本生物工学会大会, 同講演要旨集p.245 (富山). 鈴木市郎, 白至桓, 杉田龍兵, Natalia Nakamura Gouvea, 武田穣, 小泉淳一. (2016). "伝統的発酵食品の製造工程における細菌混入経路の次世代シーケンスによる解析." 第68回日本生物工学会大会, 同講演要旨集p.190 (富山). 白至桓, 鈴木市郎, 武田穣, 小泉淳一, 白承椿, 崔銀河. (2016). "次世代シークエンサーによる微生物叢解析からのゴチュジャン製造工程と製造季の特徴." 日本食品工学会第17回年次大会, 2P31 (東京). 田小維, 鈴木市郎, 小林剛, 清水孝昭. (2016). "Biodegradation characters of chlorinated volatile organic compounds for thermal-enhanced biostimulation." 第50回日本水環境学会年会, P-E03 (2016). 大野勝俊, 八太美和, 山田弘樹, 武田穣, 鈴木市郎, 小泉淳一. (2002). "有鞘細菌Sphaerotilus natansの鞘を構成する多糖の構造解析." 平成14年度日本生物工学会大会, 同講演要旨集p.187. (大阪). 菅原正孝 (大阪産業大学), 藤川陽子 (京都大学), 殿界和夫 (NPO法人 地下水利用技術センター), 鈴木市郎 (横浜国立大学) 「鉄バクテリア法を用いた地下水中の鉄・砒酸・亜砒酸の同時除去技術」. 公益財団法人高橋産業経済研究財団 一般研究助成. (2015-2017). 「伝統的発酵食品生産の品質管理における次世代シーケンスを利用した微生物群集構造解析の応用」 代表. NEDO戦略的省エネルギー技術革新プログラム. (2015-). 「汚染地盤を掘らずに省エネ浄化できる加温式高速浄化システムの開発」 竹中工務店, 横浜国立大学,　岡山大学. 生物ろ過によるヒ素・鉄・マンガン・アンモニア同時除去. (2006-). 京都大学, 大阪産業大学, 横浜国立大学. 鈴木市郎. (2016). "東日本支部・温故知新(8) : 横浜国立大学理工学部化学・生命系学科バイオ教育プログラム(大学院工学府機能発現工学専攻)生物システム工学研究室. "生物工学会誌, 94(1), 42. 鈴木市郎. (2011). "東日本支部の生物工学教育活動(4): 高校生セミナー. "生物工学会誌, 89(7), 417. 大槻隆司, 鈴木市郎. (2010). "東日本支部の生物工学教育活動(1): 学生発表討論会." 生物工学会誌, 88(1), 28-29. 鈴木市郎, 小泉淳一. (2008). "PSM: 「理数系のMBA」にみる米国の産学連携教育." バイオサイエンスとインダストリー, 66(4), 203-207. 鈴木市郎, 岡崎慎司, 小泉淳一. (2008). "理系大学院における実務者教育: 米国Professional Science Master's (PSM)と横浜国立大学大学院工学府PEDプログラム." 生物工学会誌, 86, 128-130 (2008). Copyright © Biosystem Engineering Lab., Yokohama National University. All rights reserved.